Lisa Ellis, Conservator, Sculpture and Decorative Arts, and Andrew Nelson, Associate Professor of Anthropology, Western University, discuss their scientific studies of the prayer beads in Small Wonders: Gothic Boxwood Miniatures. In a matter of minutes see the month long conservation treatment of Henry Moore's Large Two Forms, the monumental bronze sculpture at the corner of McCaul and Dundas Streets, now a cornerstone of Toronto’s cultural landscape. Treatment included grinding out stress cracks, welding repairs, the application of patination chemicals and a protective coating of wax using propane torches. Sherry Phillips, Conservator for Contemporary and Inuit Art at the AGO, talks about conserving Michael Snow's Seated Sculpture (1982), one of 14 sculptural works in the exhibition Michael Snow: Objects of Vision. AGO Conservator Katy Whitman talks about why Polaroids are different from other types of photographs and the challenges of preserving images made in this medium. There are several Polaroids in IAIN BAXTER&: Works 1958-2011 and Katy talks about her role in making sure these photographs can withstand being shown in the Gallery. 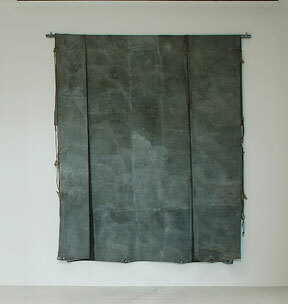 Listen to AGO conservator, Sherry Phillips, talk about Betty Goodwin's Tarpaulin # 8.